Despite only being in his mid-twenties, Callum Best has already been playing hockey at EPL or NIHL level for a decade having made his senior debut in 2008 aged just 16. A product of the junior setup in Guildford, the forward dressed 30 times for the Flames in the EPL in 2008/09 before moving on to the Slough Jets and Bracknell Bees the following term where he made a combined total of 54 outings. Having represented Great Britain at under 18s level in the World Junior Championships, he then travelled again – this time switching to the Basingstoke Bison for 2010/11 where he clocked up a further 54 EPL games. 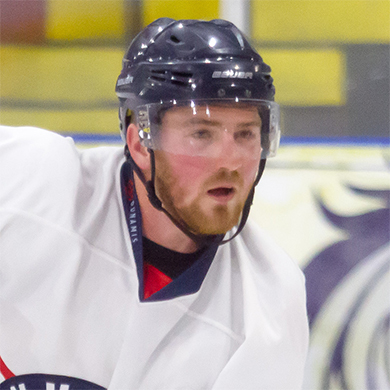 In 2011/12, Callum Best began the campaign in the ENIHL with the Slough Jets but soon switched to Kent to join up with the Invicta Dynamos. Over the next two seasons he featured 71 times for the Mos across all competitions and secured 127 points with 42 goals and 85 assists. Injury brought his second term in Gillingham to a premature end but he was back on the ice in 2013/14 having completed a move to Streatham. The forward settled in South London and it was here that he stayed for the next four seasons barring a brief spell back in the EPL with Guildford at the start of 2015/16. Between 2013 and 2017, Best made 141 appearances for Streatham and found the target 99 times whilst playing a role in 149 more for an impressive tally of 248 points. Last season Callum Best moved back to Bracknell and he featured 40 times for the Berkshire outfit racking up another 47 points. 17 goals and 30 assists saw him play a key role for the Bees but now the 26 year old forward returns to Kent and the Dynamos where he will once again don the number 11 jersey at Planet Ice, Gillingham.